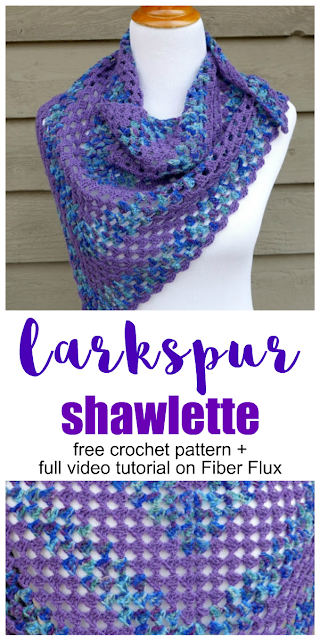 Fiber Flux: Free Crochet Pattern...Larkspur Shawlette! 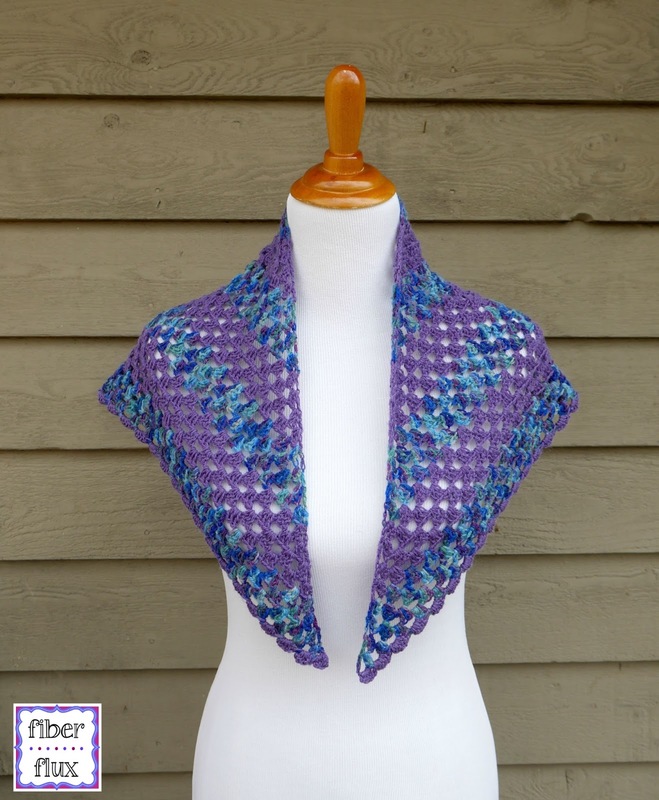 The Larkspur Shawlette is a pretty little accessory that is perfect for warmer weather when you just need a little something extra. Using alternating rows of variegated and solid colors makes a fun piece that is interesting to work up. 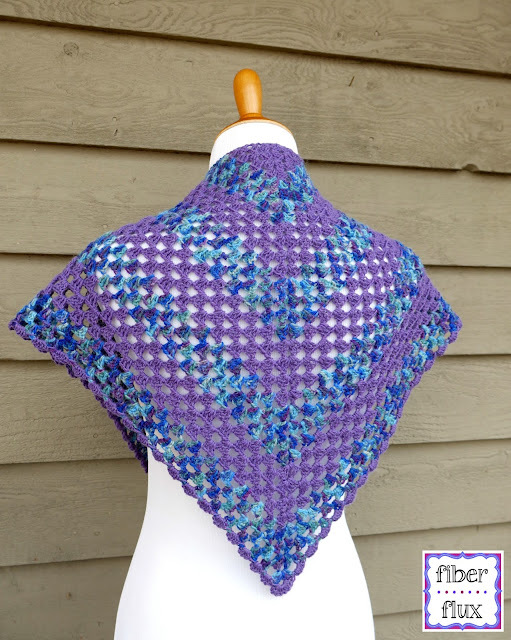 A simple granny triangle construction with a pretty and simple scallop makes this piece fun for beginners and seasoned crocheters alike! 460 yards of sock yarn of your choice (yarn used in the piece pictured is Adriafil's Calzasocks, 1 skein "Violet" and 1 skein "Multi-Purple" Each skein is 230 yards for a total of 460 yards. Feel free to use your favorite sock yarn, there are so many gorgeous choices out there! Note: To make the shawl as shown, work 4 rows of each color. Ch 4, then in the ch furthest from the hook sl st to form ring. Row 1: Ch 4 (counts as a dc, ch 1), the work (3 dc, ch 2, 3 dc) in center of ring, the work (ch 1, dc) in the ring. Row 2: Ch 4 (counts as a dc, ch 1), the work 2 dc in the ch 1 space from the previous row, then ch 1. Work (3 dc, ch 2, 3 dc) in the ch 2 space (top corner peak) from the previous row, then ch 1. Work 2 dc, ch 1 in the ch 1 space from the previous row, then a dc in the third ch of the turning chain. Row 3: Ch 4, 2 dc in first ch-1 sp, ch 1, 3 dc in next ch-1 space, ch 1, (3 dc, ch 2, 3 dc) in ch-2 space, ch 1, 3 dc in next ch-1 space, ch 1, 2 dc in ch 1 sp, ch 1, dc in last dc. Row 4: Ch 4, 2 dc in first ch-1 sp, (ch 1, 3 dc) in each of the next 2 ch-1 spaces, ch 1, (3 dc, ch 2, 3 dc) in ch-2 space, (ch 1, 3 dc) in each of the next 2 ch-1 spaces, ch 1, 2 dc in ch 1 sp, ch 1, dc in last dc. Row 3: Ch 4 (counts as a dc, ch 1), then work 2 dc, ch 1 in the ch 1 space. Work 3 dc, ch 1 in the chain 1 space. Work (3 dc, ch 2, 3 dc) in the chain 2 space (top corner peak). Ch 1, then 3 dc in the ch 1 space, then ch 1, then 2 dc in the ch 1 space, then ch 1, then a dc in the last dc. Row 4: Ch 4 (counts as a dc, ch 1). Work 2 dc in the ch 1 space, then work (3 dc, ch 1) in each of the the next ch 1 spaces, then ch 1. Work (3 dc, ch 2, 3 dc) in the ch 2 space (top corner peak), then work (ch 1, 3 dc) in each of the next ch spaces, then ch 1. Work 2 dc in the last ch space, ch 1, then a dc in the last dc. Repeat row 4 until shawlette is as large as you'd like it to be, switching colors as often as you like (shawlette shown is worked in 4 rows of each color before switching). Fasten off and procees to edging instructions below. 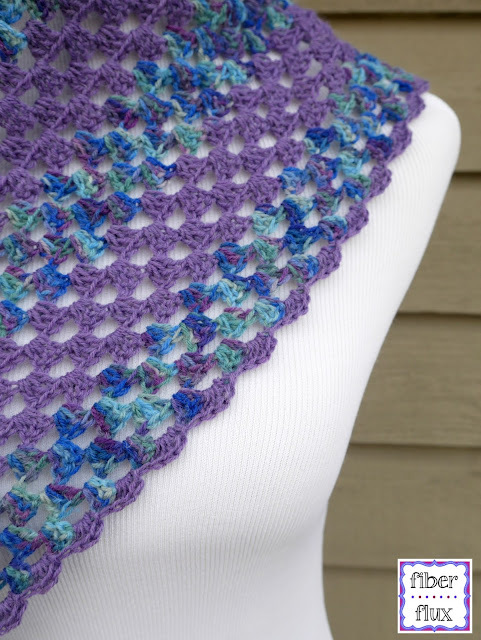 Note: As you repeat row 4, each side will have a (3 dc, ch 1) added to each row on both sides as the shawlette grows in width and height. Tie new edging color on and ch 3. Turn piece and work 3 dc, sl st in the first space. *Work 4 dc, sl st in the next space. Rpt from * to top peak/point (corner) of triangle. When you reach the top peak, work 8 dc, sl st in the ch 2 space of the peak/point. *Work 4 dc, sl st in the next space. Repeat in each space from * to end of row and fasten off. Love it! I added it to my wish list and am flagging this post. 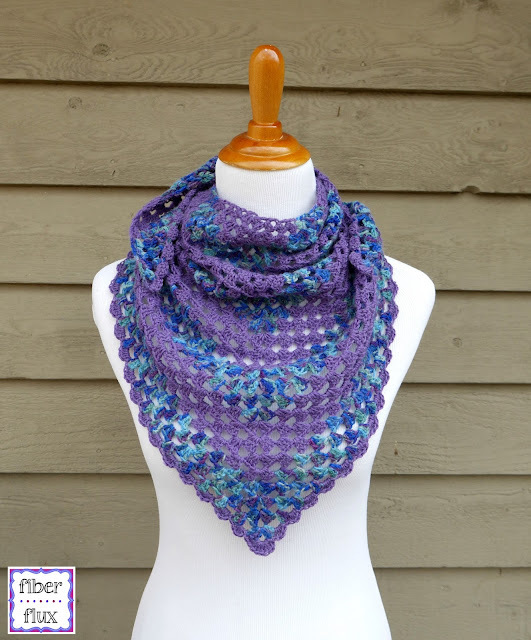 I think this just might have to be my next crochet project! Love, love, love the color combo. 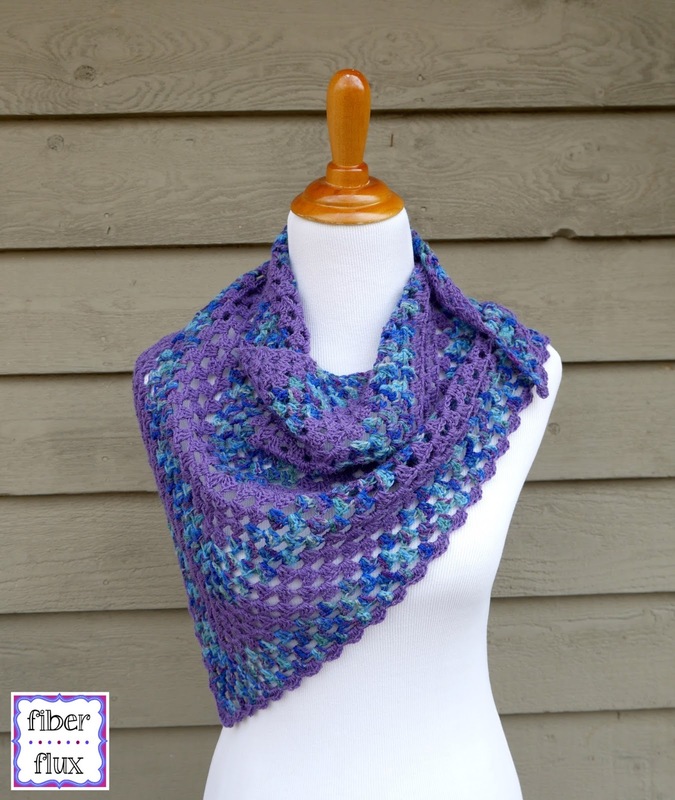 If I win the yarn, I would make one of Fiber Flux's scarves. It's hard to choose cause I love them all!